Instant water heaters provide hot water when it is needed and one does not have to wait for the storage tank to fill up. Water is heated instantly when the cold water enters the unit. Water is heated either through a gas burner or an electric unit. While the equivalent energy needed in instant gas heaters is less, the electricity needed for instant electric water heaters is very high. 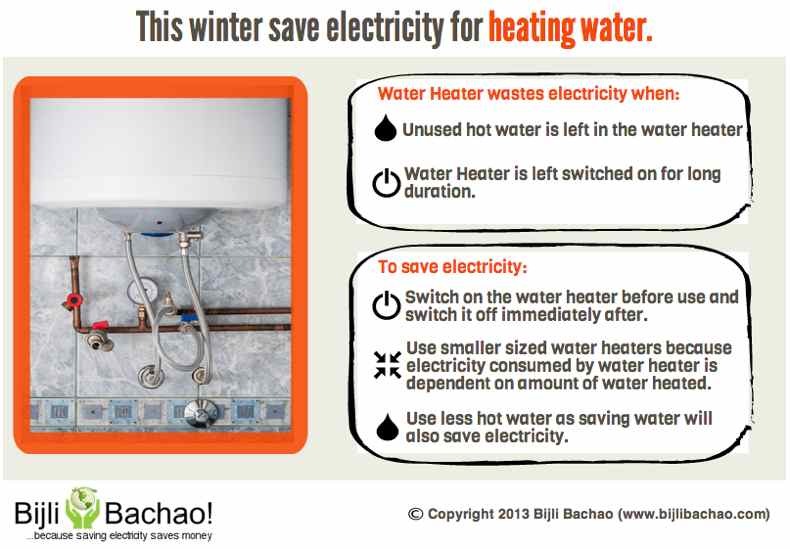 Instant water heaters provide hot water at a rate of 7.6 – 15.2 lts per min and thus it is not good to provide hot water for multiple activities happening simultaneously as the hot water is not stored. Storage water heaters store water in a big container and heat it up. A storage heater works by releasing water from the top of the tank when tap is turned on and fills up the water from bottom of tank. Effective thermal insulation for storage water heater is very important as it can have standby heat losses. The BEE 5 star rated water heaters have lower standby heat losses in comparison to the others. This kind of water heater is ideal for situations where there is lot of use of hot water (for multiple activities or multiple people). Large sized storage water heaters can also provide hot water for multiple activities simultaneously. One just has to remember that there can be heat loss if water is kept in the container for a long time. This kind of water heater is good for a family of 4 and more where water can be heated and stored (as this kind of water heater consumes lesser electricity for the same duration of use and also has thermostat which keeps the temperature of water maintained). Solar water heating is the most efficient and economical way of water heating, because the heating happens at no operating cost (sunlight is free). The only drawback is that a backup is required for them for cloudy days or in case of increased demand. Government supports use of solar energy and so a lot of rebates and benefits are available for solar water heating. We will have more details about solar water heating in a separate post. With piped natural gas available in lot of cities today, a lot of people are going for gas water heaters. Gas water heaters are available in both variants: instant and storage. While gas geysers are more economical than their electric counterparts, it does has some drawbacks. In most cases, gas water heater require use of cylinder and hence require additional space and safety practices. The cylinder must not be placed inside the bathroom as it may release carbon monoxide fumes. With piped gas one also has to make sure that the pipe goes up to the location of water heater making installation in an existing apartment a little difficult. Finally it is recommended buying a branded water heater as unbranded ones can be inefficient and unsafe. Unbranded water heaters can be cheaper but they do not comply with standards and do not have BEE star rating. It is very important to see BEE star rating before making any purchase.